Dominos Pizza in India opened 37 new stores in Q3 FY 2013. Present in 118 cities as on 31 December, 2012, up from 100 cities as on 31 December, 2011 Domino’s Pizza network extended to new cities such as Guntur, Navsari, Ankleshwar, Tirupur , Ambala and Tumkur coupled expansion in existing markets. The Same store sales (SSS) growth in Q3 FY13 at 16.1%; SSS growth in 9M FY2013 at 19.2%. 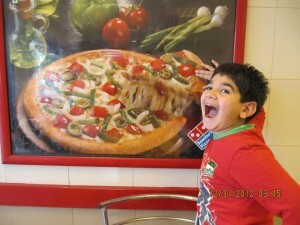 The Company has a target of launching 110 Domino’s Pizza stores in FY13. Launch of Cheesy Boloroni Pizza – Pizza with a unique mix of Veg Bolognese sauce and Macaroni, topped with a layer of a new Barbeque flavored liquid cheese and finished with Mozzarella cheese and toppings. Launch of Taco Indiana – Expanded menu offering with launch of new side called Taco Indiana which is an exciting amalgamation of the Mexican Taco and Indian flavours. Excellent response to Dunkin’ Donuts gifting initiatives through the Festive gift pack launched during the Diwali period. This special gifting pack contained several unique and new to market products inspired by the festive mood and the spirit of celebration. Dunkin’ Winter Blast launched in December 2012 with new varieties of winter donuts and hot chocolate along with impactful engagement driving initiatives at the store. The launch was highly appreciated and received positive response from consumers, enhancing Dunkin’ Donuts’ awareness and increasing footfall at the stores. 8 Dunkin’ Donuts restaurants have been launched, enhancing the brand’s presence in the Delhi NCR region. For FY13, the Company maintains a target of launching around 10 restaurants. Whereas over a longer, 5 year time horizon, JFL plans to roll-out 80-100 Dunkin’ Donuts restaurants in India.